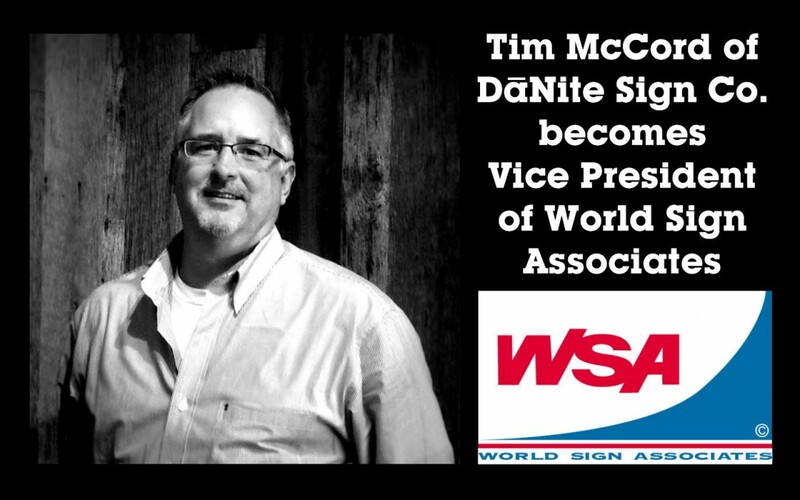 Tim McCord, president of DāNite Sign Company, was officially welcomed as 2015-2016 vice president of World Sign Associates at the organization’s 68th annual meeting in San Antonio, Texas. As World Sign Associates’ vice president, McCord will help lead the premier trade organization’s direction over the coming year. World Sign Associates’ members represent some of the industry’s top sign manufacturers. Members craft custom signs as well as signs for regional and national programs, either by working independently or by combining the strengths of nearly 200 sign manufacturers and suppliers throughout North America. Founded in 1947, World Sign Associates offers an executive forum for fellowship, support and the exchange of ideas. WSA members adhere to the highest ethical business standards and bring the utmost value to their customers. DāNite Sign Company provides full-service, state-of-the-art production, permitting, installation and service of on-premise signage for businesses both large and small throughout Ohio. Products range from simple window vinyl with store hours, to planned development sign packages, or multi-location national branding. DāNite Sign Company’s trained and equipped installation and service departments are capable of repairing neon and electronic message centers.